The November issue of Ski Magazine arrived today with a focus on family skiing and skiers. I was particularly taken with an article entitled "Just the Two of Us" by Megan Michelson. She was lamenting the replacement of a the Gad 2 double chair lift at Snowbird with a new high speed quad. Her concern is tied in with the loss of camaraderie of just two people on a ride up the mountain. 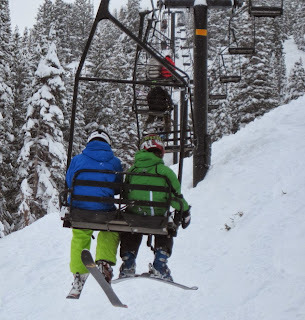 Two people on a lift, be it long time friends or simply strangers, seem to share a lot in the isolation of their ride. However, with a quad ride there are many more complexities of relationships and exchanges that minimize more meaningful sharing beside the pleasantries of the day. With the installation of the new quad chair at Greek Peak, I can see that same thing happening with the geezer skier group. In groups of four there is less likely to be a sharing of significant happenings and feelings. Yes, geezer guys do have feelings that they often need to express. With the intrusion of smart phones, iPods and other electronic devices we have lost a lot of one on one communication. Perhaps the double chair is the last bastion of a venue for meaningful conversation between old friends and also new acquaintances. While I will enjoy the new quad at Greek Peak, I will also enjoy the double chair rides with close friends and the opportunity to get to know new people as well. Just like Megan says in her article faster and bigger is not always better for the social dynamics of the ride.